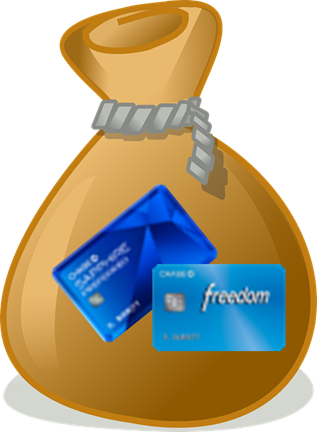 Via an inside source, I’ve learned that Chase plans to offer increased signup bonuses for the Sapphire Preferred and Freedom cards. The expected go-live date is November 16, but sometimes deals like these appear a bit sooner in some channels, such as through Chase’s refer-a-friend program. Both cards earn Chase Ultimate Rewards points. With a premium card like the Sapphire Preferred card, points are transferable to a number of airline and hotel programs. For more details, please see: Quick guide toransferable points programs. Details: Earn 50,000 bonus points (usual offer is for 40,000) after $4K spend in 3 months. Earn an additional 5,000 bonus points for adding an authorized user. Chase has a program called Chase Private Client for their high value customers. If you’ve been invited to join, do it! Private Client bankers often have better signup bonuses that they can offer to their customers. With the upcoming promotion, we’re expecting to see the Sapphire Preferred at 65K (60K + 5K for adding an authorized user) for Private Client members! Details: Earn 15,000 bonus points (usual offer is for 10,000, but we occasionally see 20,000) after $500 spend in 3 months. Earn an additional 2,500 bonus points for adding an authorized user. Note: Points earned on the Freedom card are not directly transferable to airline and hotel programs, but you can move points to your (or your spouse’s or business partner’s) Sapphire Preferred or Ink Plus account and then transfer to an airline or hotel program. See: How to share Chase Ultimate Rewards with friends. Lately, Chase has been denying many/most applications for the Sapphire Preferred, Freedom, and Ink cards when the applicant has applied for more than 5 cards in the past two years. If you haven’t applied for many cards in the last two years and you have a decent credit history, you should be fine. If you have applied for a lot of cards, consider applying in-branch. Those with Chase bank accounts who apply for cards through their local banker seem to have a better success rate (anecdotally). Sometimes the banker is able to advocate on the applicants behalf to push approvals through. Remember that you cannot get a signup bonus for a Chase card if you received a signup bonus for the same card within the past 24 months. So, if you signed up for the Sapphire Preferred card in the past, make sure you received the bonus more than 24 months ago. You also must not have the card anymore, but it is OK if you cancelled or downgraded the card less than 24 months ago. I got this card August 19th, I’ll send an SM asking them to match, but I highly doubt they will. Highly doubt it? Why? Because the offer doesn’t exist? Hello! C’mon, use some common sense. I got the CSP in August and called them today to ask for a match. No luck. Why would you call in to ask to match an offer that doesn’t exist? Why do bloggers always seem to assume that adding an AU is no problem, almost automatic? Even when I was married my husband would never have let me mess with his credit (and vice versa). And, since most people are not married, who are you all adding as AUs? This is a great question. I feel the same way. Why don’t you have your husband hold onto the card so you can’t use it, or just cut it up after 1st use? You only need it for the points, not for their line of credit. Exactly. I add my wife as an AU to every card I apply. She just doesn’t use it, better yet we don’t even activate it (unless when needed to trigger the bonus)… we just put it away in the corner of a drawer. You can use any family member, or even friends as an AU. Just don’t let them have the card, it’s super simple. You can add pretty much anyone. At different times I’ve added my son, my niece, my sister. You could add a friend too. While the accounts appear on their credit report, there is no hard pull for them, so I’m not aware of any real downside except one: some have reported that Chase considers AU cards when looking to see how many accounts you’ve opened in the past 2 years. I think they’ve fixed this but I try to assign AU cards to people who won’t be applying for Chase cards. Just in case. Maybe that is why you are not married anymore??? All chase asked for was the name to put on the card. No SSN or any other personal information. The card has the same card number on it. My AU doesn’t know he is an AU, it certainly cant hurt his credit. I get AU for my wife for every single card I got, and 99% of them are just kept in my socks drawer. Most of the time you don’t even need people’s SSN to add them as AU…You can add anyone, even your altered ego as AU. I really don’t see how adding AU can be a problem. Wouldn’t you be pissed off if you found out someone got a card in your name without your permission? I sure would. Most of my relatives are overseas, so for me it’s easy to get any of them a card. For example for Chase, all you need is one’s full name. Of course I would! That’s why I ask first and get permission and fully explain the situation. That’s great that you do that but others here implied that they don’t. I erroneously thought you were replying to my post regarding AU cards. I’d hope that everyone here would know better than to create cards in someone else’s name without their consent and explanation of your intentions although I know better than to assume that’s what everyone does. I think you’re aiming your displeasure at the wrong person/source. FM is one of the higher quality sources for all-around value when it comes to this MS/Churn/discounts. You mention “when” you were married your husband wouldn’t let you have an AU card. Was that not a red flag that there was some trust issues going on re: money and finances? I know everyone is different but if I or my wife suggested such a thing to each other there’d be some major fighting going on because it suggests an underlying issue beyond an AU card. Even those couples who believe in separating finances while married would have more reason to have AU cards than not. Obviously this isn’t a psychology and relationship forum but I’d hope you see my point regardless. Btw, you can have an AU card for more than just your spouse. Your mother, your father, a friend, a room mate…. do I need to go on? Heck, on Serve/BB/RB cards there are people creating AU cards for their pet gold fish named Guppy and their cat named Whiskers! Ethical or not it can be done. Wouldn’t what you described not only be unethical but also fraud? Do you have any idea how these people get away with using fake names? Wouldn’t they get caught eventually as some stores require ID for some purchases. I completely agree that it’s unethical and fraud to create AU cards for fictitious people. I also do not support the idea of trying to use a credit card in-store that is in someone else’s name. I was only illustrating the fact that AU cards can be done. Any friends or family or room mate that gives their consent is enough opportunity for those who are single and looking for legit AU cards. I’m sure you realize this but just to be clear I wasn’t asking you for advice on how to get away with using someone else’s card. I just more curious how they get away with it. I had CSP for more than two years (since May 2013) and two months back (Sep 2015) I downgraded it to Chase Sapphire. Is the 24 month rule for the time since “i got the last bonus” or since “I applied for the card”? If its for the bonus, is there a way i can find out when I got the bonus on my card? U can probably see when you got the bonus by looking at your Ultimate Rewards account online. If not, it’s safe to assume you got the bonus 4 months after applying. Thanks for this info! I checked my ultimate rewards account but it only shows activity going back 2 months (I guess it shows me the activity on only CS and not CSP from the time when I downgraded it). Anyhow thanks! Check your credit card account statements. It will show you the bonus points. Yes. If you are approved. I’m not sure the Freedom bonus is big enough to be worth the risk. in my recent experience, the ink cards don’t seem to fall under the 5 card rule. Good point. I wouldn’t expect them to because it falls on your business credit history instead of personal. The Ink cards are handled more in the sense that the business is the account holder and you (“employee”) are really an AU. It has nothing to do with “business” credit history. Chase looks at your inquiries. Your personal credit report will have every business card inquiry that used your SSN. There are exceptions to the “five inquiry” rule. Do some research, and you’ll see that people have gotten Chase cards with more than five cards in two years. Do you mean that you were approved for an Ink card despite more than 5 recent inquiries? Do you think this Freedom bonus is worth applying for? When (If ever) do you think the 20K offer will return? Yes. At most we’ve seen 20K in the past. We don’t know if/when that will happen again. Adding AU may not be a good idea, as there are reports that AU counts towards the 5 cards in two years to Chase. Just a thought. I can confirm this, although after protesting, the rep accepted that those are AU and SO was eventually approved. I have 5 accounts in past two years(one of them is authorized user), got declined last month by applying online for CSP. Recon, special consideration, and secure message didn’t work either. If I want to try it again, what kind of banker would you recommend that may “be able to advocate on the applicants”? Thanks a lot!!! Best would be if you could get into the Private Client program. Otherwise, just go to your local bank and ask about credit cards. The freedom 20k offer will return on november 30th. Any tips on making it to their chase private client? Or anyway to make it quicker? Today, a personal banker from chase confirmed to me that the increase will indeed go live the 15th. They are actually being product trained on this to notify potential customers. So good news! When exactly should we expect to see these links? Anyone seen the Chase 55k offer that FM said is going live today? How to get it?